Why would that be so? After all, even under the guidance of the most brilliant programmer, a computer can’t ensure that a manuscript has accuracy, clarity, or elegance of expression. But a computer can fix hundreds of mechanical problems that editors shouldn’t have to worry about, and it can do it quickly and consistently. If something can be automated, then automate it! Let the computer do the heavy lifting. Why is that important? Because it enables you to do more work in less time, and it frees your mind to concentrate on the things that a computer can’t handle (like accuracy, clarity, and elegance of expression). If you’re working for a corporation, that makes you more valuable as an employee (making raises more likely and layoffs less likely). If you’re working for yourself, it enables you to earn more money for the time you put in (as long as you’re charging by the job, the word, or the page, which you should be [see, e.g., On the Basics: Dealing with the Perennial Question of Setting Rates for Our Work]). Learn to record and run macros to automate repetitive editing tasks. My Macro Cookbook for Microsoft Word is a good starting place. Use Microsoft Word add-ins (like the ones I create at The Editorium) that expand Word’s features to automate various editorial tasks. Let’s look at what some of those add-ins can do to ease your workload. Want to try it? 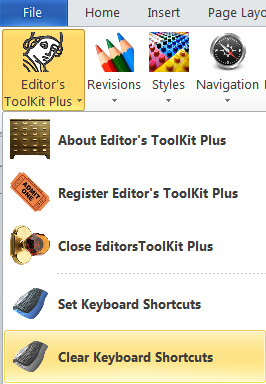 All of those options are included as part of my Editor’s ToolKit Plus 2014 add-in, which I highly recommend that you download and try. The program offers a 45-day trial period so you can make sure it does what you need before deciding to buy. And if you need help using it, I’m always available by email. I’d like to point out one special feature of FileCleaner that is frequently overlooked. See that option (under “Formatting”) to “standardize font formats (remove overrides)”? It removes all those odd, inconsistent uses of different fonts that authors like to use, but at the same time it leaves italic, bold, superscript, and styles intact. You won’t believe what a difference this can make in cleaning up a manuscript! FileCleaner also offers to clean up the active document, all open documents, or all documents in a folder, which means you can run the program on a whole batch of files at once while you go back to reviewing manuscripts (or spending time with family and friends). Remember all of my talk about automating what can be automated? This is what I’m talking about. Instead of manually doing dozens of find-and-replace routines on dozens of documents, let FileCleaner do the work. Save the list as a Word document, and you can use it over and over again. To get you started, MegaReplacer comes with a long list of useful corrections that you can modify to meet your needs. Furthermore, Editor’s ToolKit assigns these tasks to the function keys on your keyboard. Need to italicize (or romanize) a word? Press F8. Want to transpose two words? Press F11. To lowercase a word, press F10. But if you find that you like the Editor’s ToolKit keyboard assignments, you can activate them by clicking “Set Keyboard Shortcuts.” The program download includes a keyboard template that lists the default shortcuts; print it out and place it above your function keys, and you’ll have a handy guide to which key does what (remember WordPerfect 5.1?). The keyboard shortcuts for Editor’s ToolKit are not arbitrary, by the way. 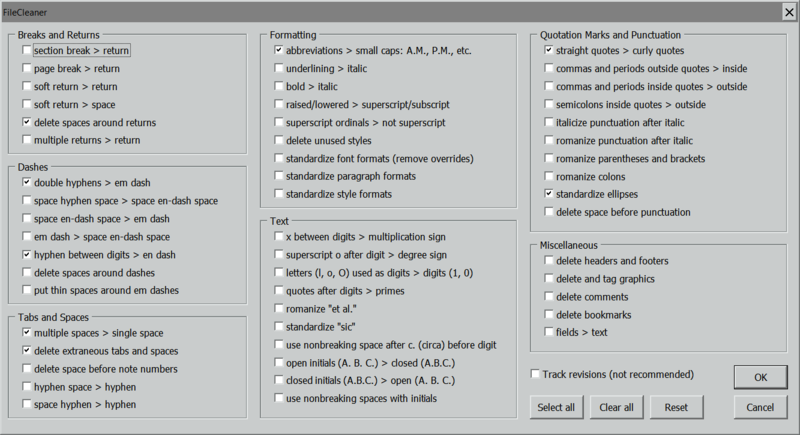 I’ve tried to arrange them so that the most common editorial tasks are right at your fingertips. For example, F7 toggles italic on and off. Yes, CTRL + I does the same thing, but after you’ve used F7 a few times, CTRL + I will seem clunky and annoying. Something that small does make a difference in how easily and smoothly you’re able to work in Word (see Lyonizing Word: The Right Tool for the Job and Lyonizing Word: Assigning Macro Shortcut Keys). All of these are small things, but in the pressure-cooker of day-to-day editing, small things make a big difference in the ease and even the pleasure with which these tiny tasks can be accomplished. I’ve been a working editor since 1978, so I’ve been doing such tasks a long time. I created these tools (and the many others included with Editor’s ToolKit Plus) so that my computer can handle the boring, repetitive, mechanical tasks, allowing me to do the more enjoyable and important work that a computer, no matter how sophisticated, simply cannot do. That, right there, is the reason for computers. How do you use your computer to make your work easier and faster? I’d love to hear your ideas.